He was born on his mother’s (Bridget Murphy) family’s farm. The farm had been the Murphy’s for generations but since Ireland was under British rule at that time (Queen Victoria), they had to pay rent to an absentee British landlord. Frank was one of nine children, all of whom worked on the farm. The others were Andy, Paddy, Edward, Michael, Anthony, Mary, John James and Maggie Alice. At that time, it was the custom for some of the children of large families to live with relatives who needed help on their farms. So he lived for a long time with his aunt and uncles, the Murphys. Michael also lived with relatives. Anthony later remembered Frank as a boy who was a “great worker” and, as a big brother, who carried him down the hills when he got hurt. According to his sister Mary, Frank was very good with small children, and kids seemed to take to him right away. As an Irish farm boy, he cut and gathered hay, took care of sheep, and cut turf in the bog for the turf fire. Ireland had compulsory education, and Frank attended the Four Masters National School in Copany. He walked a long distance to this two room school house, usually barefoot, usually with other kids and sometimes with a few sheep they might be herding to graze on a neighboring field for the day. The children were taught to read, to write and to do arithmetic. These basic skills combined with knowledge of the English language helped many of them later to get jobs in America and to help their own children get ahead in America. Because of centuries of British mistreatment of native Irish and the constraints they placed on the Irish economy, there were few opportunities in Donegal for young Irishmen at that time. So many of them left Ireland to seek work in England, Scotland, Australia and the United States. One night In 1910, at the age of twenty, Frank put his things in a bundle, snuck out a window and joined up with his first cousin, Hugh Cassidy, who was two years younger, and they ran away from Leghowney eventually crossing the Irish Sea to Glasgow, Scotland. Young, strong and fearless, they got jobs on the railroad lifting heavy sleepers (timbers under the rails) and lived in Mrs. Adams’ boarding house. They earned one pound a week and gave Mrs. Adams 12 shillings for room and board, which included an egg every other day. After a while Frank left the railroad job for a job with the gas company, where he received an increase in pay of one shilling a week. He gave the shilling to Mrs. Adams and she began giving him an egg everyday, while poor Hugh continued on the railroad and got an egg every other day. Eventually, Frank worked in an rubber vulcanization factory and saved his money for passage to America. Both he and Hugh applied for papers to go to the U.S. but when they finally got their papers Hugh decided that he didn’t want to go so far away from his brothers, who were all in Donegal. Frank, on the other hand, had his brother Andy waiting for him Georgia. On October 5, 1914, during the first World War and shortly after the Lusitania was sunk, he boarded the SS Pannonia. The ship crossed the Atlantic in nine days, arriving in New York Harbor and passing the Statue of Liberty on October 14, 1914. After being processed through the Ellis Island immigration center, Frank was met by his brother Andy, who took him into New York City. To celebrate his entrance to America, they stopped in a tavern for a beer. As was the custom at the time, they were offered free sandwiches to go with their beer and, when asked what he thought about America Frank said, “It’s a great country.” He then headed for Macon, Georgia where he worked in a bar and in the coal mines. In 1917, the United States entered World War I. Both Frank and Andy got drafted into the Army. Andy went first and was sent to the front line in France, where he was gassed and wounded with shrapnel. After basic training in Fort Dix, New Jersey, Frank boarded a ship bound for England, America’s ally. Little was ever said later about the activities during the “time of the troubles”. These activities were top secret and dangerous; they led to freedom for Ireland, the end of absentee ownership of the Cassidy-Murphy farm and the beginning of Ireland’s long journey to prosperity and leadership in the European Union. In the summer of 1918, Frank’s battalion, serving under General Pershing, boarded open boats and crossed the English Channel with packs on their backs. When they landed in France, they marched for days at a time, camped in the woods and prepared to meet the Germans. This was part of a huge offensive of American troops which helped the Germans realize they were about to be overrun. Fortunately, they surrendered before Frank’s battalion got to the front. World War I and the Irish Uprising of 1916-1921 were the most significant events that the Cassidys of Frank’s generation participated in. By virtue of their circumstances, the Cassidy brothers indirectly served on opposing sides–some with the British and some against. But none were really warriors at heart and hastened to forget these troubled times and move on with their lives. After the armistice was signed in 1918, Frank returned to the United States, where he received an honorable discharge from the Army, (which included favorable comments from Major O’Hara) a medal for foreign service, and most important of all–citizenship in the United States by virtue of his service to the country. Frank’s training, overseas service and discharge took less than a year. In 1928, Frank got a job with Borden’s Dairy, which was around 135th Street in New York City. His starting wage was $29.50 per week. A year later, he got a raise to $30.00 a week, but after the Great Depression hit in 1929, his pay was reduced to $29.00. But he didn’t complain because, at the time, jobs were extremely scarce, and everyone was poor. Around this time, he began living on 135th Street and Amsterdam Avenue with his brother Michael and his family. Michael was a bus driver with the Fifth Avenue Line, and the bus garage was also in this area. Andy had settled in Bayonne where he worked in the Standard Oil (ESSO) refinery. In 1943 Frank married Eileen Cassidy, who had been born in the neighboring section of Donegal known as Aughlim. She had left Ireland at the age of nine and had grown up in Boston. Her older sister Marion was already married to Frank’s brother Andy. Frank and Eileen got an apartment at 2834 Heath Avenue in the Kingsbridge section of the Bronx. Their son Jimmy was born in 1945, and Don was born in 1947. In 1952, the family took a trip to Donegal, where they spent six weeks living with Grandmother Bridget Murphy, uncles Paddy and Anthony and Aunts Mary and Maggie Alice. They helped gather hay with cousins Eamon and Barney Devlin and two adopted boys living on the family farm–John Alexander and Pat Quigley. At the time, the family house still did not have electricity or indoor plumbing. While there, Frank bought them their first portable radio, which they called a “wire”. When Frank and his young family arrived at his mother’s house on that night in 1952 there was someone else anxiously waiting for him, his onetime traveling companion and railroad co-worker, Cousin Hugh. With characteristic humor, Hugh’s first words to Frank after thirty-eight years apart were, “You got taller!”. Shortly before this time, in 1951, Andy died after a long illness caused in part by his World War I injuries. In 1955, Frank retired from Bordens after twenty seven years of service as a pasteurizer. Armed with his veterans and Teamsters Union pensions, and Social Security, the family moved to Freewood Acres, New Jersey, to a new house directly across the street from Michael’s summer house. A few years later, Michael and wife Marie retired to live there year round. In his retirement, Frank returned his energies and attention to the soil, turning half his new backyard into a vegetable garden, where he raised Jersey tomatoes, beans, carrots, cucumbers, lettuce and squash; and grew from scratch a front hedge around the front lawn. In 1972, shortly after Michael died, and after seventeen years in Freewood Acres, Frank and Eileen sold their house and moved to Framingham, Massachusetts, near where Jimmy and Don had moved. During this time, he enjoyed reading books and following politics and the Red Sox on television. His greatest joy was playing with his young grandsons, Sean, Liam and Chris. He and Eileen also made a few trips to Ireland. While in Donegal, they stayed at his alma mater, the Four Master National School at Copany, which had been purchased and remodeled by Eileen’s brother, Father Donal. 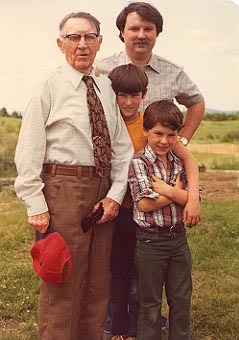 In 1980, the family celebrated Frank’s ninetieth birthday in Newport, Vermont at Jimmy’s house. In August he and Eileen made their last trip to Donegal together. Two years later, on September 12, 1982, he died suddenly while on a visit to Newport. He had enjoyed his many years of retirement and had had very little illness. Of his brothers and sisters, he was the last to die. By this time, the family homestead in Leghowney had passed to John Alexander. John was a bachelor and had a little workshop for fixing bicycles. He did no farming. But part of the family farm continued to be used by Eamon Devlin and his family. The ancestral home is now under the control of John Alexander. During his long life, Frank witnessed many dramatic changes in the way people lived, and for the most part, adapted well to them. When he was a boy, people did not drive cars, use telephones, listen to radios, use electricity, or enjoy indoor plumbing–not to mention medical insurance. In 1890, everyone in Donegal was a dirt poor tenant farmer. Yet, from that very humble beginning, he and his brothers, through persistence and hard work, were able to survive and prosper in America, to own cars and homes and to raise children who got college degrees. In the years following Frank’s death Ireland’s economic growth accelerated. By 2007 the Celtic Tiger had become the leading economy of Europe. During this time emigrants returned to Donegal, started business, built homes, raised families. Leghowney enjoyed a small building boom as new Cassidy families built modern homes on the hills of the old farms. Yet old traditions are still observed and the old generation is still remembered. In the Town on a Sunday night in 2007 someone observed that Mickey Rooney, the actor, was in Ireland. Someone else said that at his age (87) he was awfully old to be traveling so far from home. “Frank Cassidy crossed the Atlantic at the age of 90 in 1980″, shouted the learned voice of Big Michael Cassidy, son of Hugh Cassidy of Leghowney.